By BoltBait, October 15, 2012 in Plugins - Publishing ONLY! So, I was scanning a ton of photographs today and kept having to do the same steps to remove dust from the images. I automated it into a plugin. There is no UI. Just run it and the white dust specks are gone. There is now a simple UI. Select White or Black and those color specks are gone! It's not perfect. It only works on very small specks. Basically what it does is Clone Stamp them out. Install the dll in the normal way. 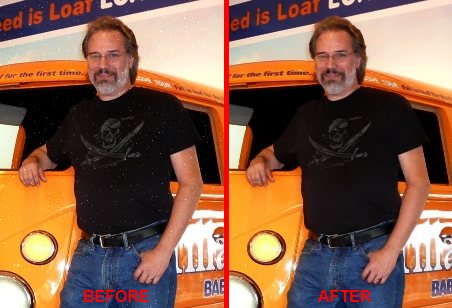 Then, restart Paint.NET and look in Effects > Photo > Remove Dust for the effect. I'm thinking "Plugin of the Year". Yes? Yeah, CodeLab is the best plugin ever. Now, I can't speak for those who write canvas plugins, but I find that actually coding a plugin is the easy part. Coming up with the idea is the hard part. In this case, I wrote it to save myself a ton of time. And, thanks for the vote. *Keeping in mind the limitations of the plugin system. It makes me fatter? Other than that I'm sold! Actually, I think its the pizza that does that. For those of us interested in the development, but without asking anyone to reveal any "trade secrets" may I ask what toolkit was used to take the code above to compiled .dll? Either way, one of the best, most useful plug-ins to any image management software I've seen anywhere. THANK YOU !!! ^^ He's too modest. CodeLab is developed and maintained by @BoltBait (free to download, donations welcomed). Damned fine piece of kit it is too! You'll find numerous excellent tutorials on BoltBait's website (link in his signature). This plug-in is great. I'm a total noob, but would it be hard for me to duplicate this to eliminate black dots? I am a total novice with codeLab, I have read about it on your website BB, but I am at a loss with this code, when I open codeLab how much of the script (code?) that is already there do I remove before I insert the above code you have provided? I tried to copy / paste this but ended up with errors at different lines. The removal of black dots is a useful tool to have with some of my scans too. 1) Highlight the above code block and press Ctrl-C.
2) Run Paint.NET and open the graphic you want to modify. After a second the effect will compile and run. If you like the effect, click OK to keep the changes. 2 words sums it up, "epic win!" - Thanks again BoltBait! Hello. I am really interested in downloading BoltBaits "Remove Dust" plugin for Paint.net version 4.0.16 but cannot find the direct link for it. I clicked on the second link below (copied from top of this page), but I'm not able to find the actual zip file. Would somebody please point me to it? Hello. I am really interested in downloading BoltBaits "Remove Dust" plugin for Paint.net version 4.0.16 but cannot find the direct link for it. Can I just select that particular plug in from the rest of the pack? Yes, you can just select what you want. It won't force you to install everything contained in the pack. Thank you so much. I will give it a go tomorrow. I guess I need THIS one? I gave you the correct link. It says "v4.0.6+". Notice the plus sign... meaning version 4.0.6 and later versions. Well this kind of stinks. I went and downloaded BoltBaitPack46.zip and it was stopped in it's tracks by my Norton 360 Antivirus suite. The zipped executable no longer works. I highly doubt that this is malware of any kind, but even turning auto protect off, Norton still caught it while trying to download it again. If anybody is interested, I attached a print screen. Norton is well known for crying wolf. Disable Norton then download and install the plugin. Better yet, delete Norton entirely - your world will be better for it. You can restore the file if Norton deletes it. In the lower-right corner of the Norton file-warning window (in rather small letters), there's a Restore link. Click on it to restore the file Norton quarantined. Is this part of your plug-in pack? Ah, yes. Duh. It's under Effects => Photo. Altogether TOO reasonable a location.